Epexio Discover delivers a modern search experience, designed to cater for a variety of levels of user. Our search technology is highly optimised for the hierarchical nature of archival records: we search across a description's entire hierachy, meaning an archivist is free to truly stick to the ISAD(G) principle of non-repitition. Facets are used on the search result screen to allow a user to widen or narrow their search. Intelligent date range parsing means that results can be ordered and filtered on dates. Epexio has been built specifically for archival metadata, and prominently displays a description's hierarchy in search results and on the full record pages. A breadcrumb above a description and a contents tree below allow the user to easily navigate through a collection. 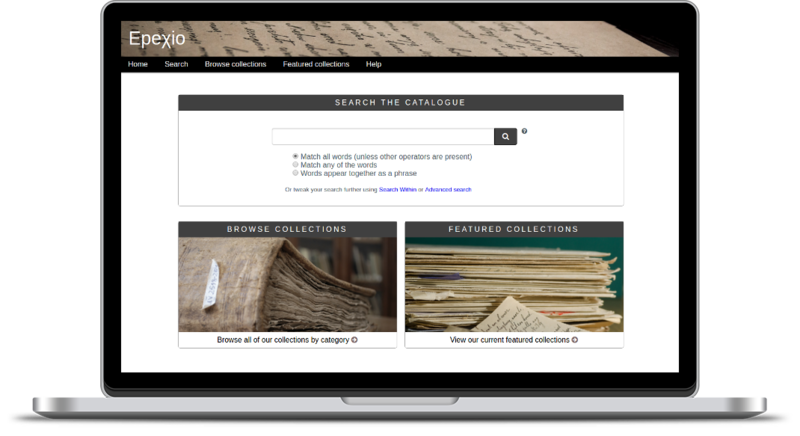 We enable a user to 'Search within' any record in the catalogue with children (collection, section, series etc. ), both from the record page and from a separate 'Search within' screen. Epexio searches over both descriptions and authority data - people, places and subjects. The search results are displayed in tabs, allowing a user to realise their search has hit authority records as well as archival descriptions, while not diluting the search results with unnecessary records. Each authority record can be viewed on its own record page, and linked back to all descriptions that have been tagged with that authority. Epexio allows an archivist to create multiple custom relationships between records in the system. Decsriptions may be linked to other descriptions using customisable relationship types and text, for example "Reply to this letter", "Agenda for these minutes". These relationships are displayed to the user in the catalogue, allowing a user to follow a web of interlinked records, particularly compelling when the records include an in-place digitisation. Epexio manages user enquiries about records: a user may add various records to a 'Basket', from which they can contact the archive about these records. The archive is notified about the enquiry, with all relevant reference numbers, ensuring that an archivist knows exactly which records an enquirer is referring to. Epexio supports regular data harvesting from (potentially multiple) systems. This data is then combined together to create a single discovery environment. Data and digital material can be harvested from Calm, CONTENTdm and Archivematica, among others. There is no need to switch from your current cataloguing system if you do not wish to. We can also ingest data from spreadsheets, csv files, EAD, and XML. Epexio supports archival standards such as ISAD(G) and ISAAR. The data entry fields specified by these standards can be set up as standard in the system. Name authorities, places and subjects can be created or imported from external sources, and linked to relevant descriptions. Epexio allows you to create any number and type of custom fields to suit your own archive's needs. Terminology can be changed to aid accessibility to the user - such as use of the term 'collection' instead of 'fonds'. Data is stored as linked data, which allows this very flexible schema, and also facilitates different uses and outputs from the data. Reports can be created based on facets of the data, for example accessions still to process in priority order, or items currently out on loan. Finding aids can be automatically generated. Epexio incorporates some key features making it easy to use by volunteers and experienced archivists alike. Data entry templates allow a screen to be set up which displays just a few fields for a volunteer to enter data into, or a screen with more complex fields to be accessible to an archivist. Drag and drop is used to create an intuitive experience. Epexio Describe is entirely browser-based and can support multiple users working concurrently. There is no need for any software to be installed and maintained on an archive's own machines. Digital documents are presented to the user in their correct hierarchical context - there is no need to link to a digital document hosted in another system. A user may view a description's metadata and read the document in situ. Records which contain a digitisation are given thumbnails in the search results, giving the user a visual cue that a record contains a digital object, and search results may also be filtered on those that are digitised. We have developed a number of different viewers to suit different types of document: from our multi-page document viewer to our glass plate slide viewer, our aim is to replicate the experience of a user flicking through the original in the archive. If metadata to the item level has been created, a record just displaying an individual page of a document with its relevant metedata can appear in search results and be displayed to the user, with a link to the record above displaying the full multi-page document. Artificial collections, or 'exhibitions', can be used to thematically group digital assets and lead a user through the content. A landing page for each exhibition allows an archivist to write some introductory text, and display the data faceted in various ways, for example by collection or level. Timelines or maps can be used to display the exhibition contents in a visual way to the user. When on a description's full record page, links take the user to the next or previous item in the exhibition. We have developed an Epexio 'widget', allowing an archive to reference digital content in external sources, for example a blog post or a timeline on an external website. This widget provides a taster of the original document held by the archive, and a link back to its full description within Epexio Discover. As well as allowing an archive to host their digital content within the Epexio system, we are also able to import digital assets from various external systems. We can act as a SWORD endpoint for Archivematica, and can harvest metadata and images from CONTENTdm. Highly customisable and mobile friendly, Epexio offers lots of options to deliver a tailored experience while still leveraging our core platform. Please do get in touch to find out how Epexio could meet your archive's needs. Based in Worcestershire, the Metadatis team combines expertise in software development and information management. We're passionate about data and metadata, and we enjoy leveraging open datasets, developing automatic extraction tools and building data enrichment technology.